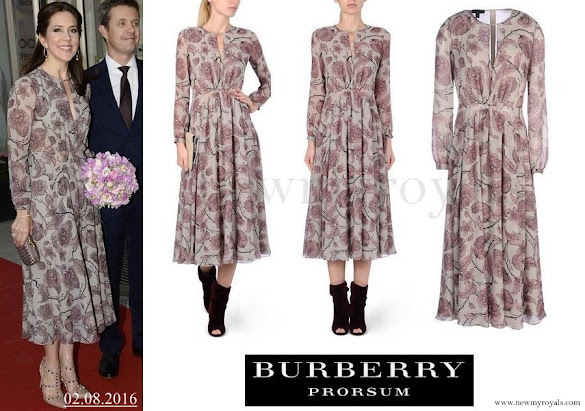 Wow - believe it or not, I have a similar dress, but it's not from Burberry. But I don't have such shoes, because I can't walk in. This one looks much better on Mary than model. How do you define "masculine"?? My goodness, I feel sorry for the poor woman who walks beside Mary and must feel the comparison. I am glad that Mary chose not to wear such shoes as on the model and the friend beside her because such a pretty, feminine dress needs pretty shoes, too. In fact, I wonder why the other woman wasn't cropped out of the photo. They are all the same photo. K Hass the other woman is also heavily pregnant. Now I see that! Thanks for enlightening me. She needs those comfy shoes, for sure. Or Christine Pii Hansen. Whoever it is I have seen her w Mary a few times. As I said, I didn't realize she is pregnant, but did NOT say she ruined the photo. I was feeling sorry for her with straps showing and hanging, thinking she was having a hard time of it. And I was concentrating on the royalty's outfit - as I thought this was about. Please don't be offended. Sigh. This is Ms. Electra's sneakiness at its best! She has displayed the comparison of the royal to the designer's model worn to a previous event. Some of these she has archived from several years before. I prefer this opposed to an updated comparison because you can see how that royal previously styled the look for other appearances! And how trends die or are modified. Quite fun! Not fond of this dress. Mary has great figure but this dress makes it dissapear. Also the color looks washed out and pattern seems more suited for autumn. Perhaps this dress looks better in real life. Marianne, I agree with you on all points. It's a teensy bit "granny" for me. Stunning. Love this dress it looked gorgeous the first time Mary wore it too.